With its incremental optical encoder and industrial design, this rugged transducer provides the highest accuracy and longest life of any measurement device of its kind. For measurements up to 60 inches, this model is available in a variety of resolutions and output stages to fit virtually any requirement. 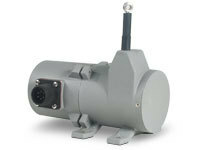 The PT8150 offers numerous advantages over other industrial-grade sensors: It installs in minutes by mounting its body to a fixed surface and attaching it’s cable to the movable object, fits into areas unsuited for rod-type measurement devices, and works without perfect parallel alignment.